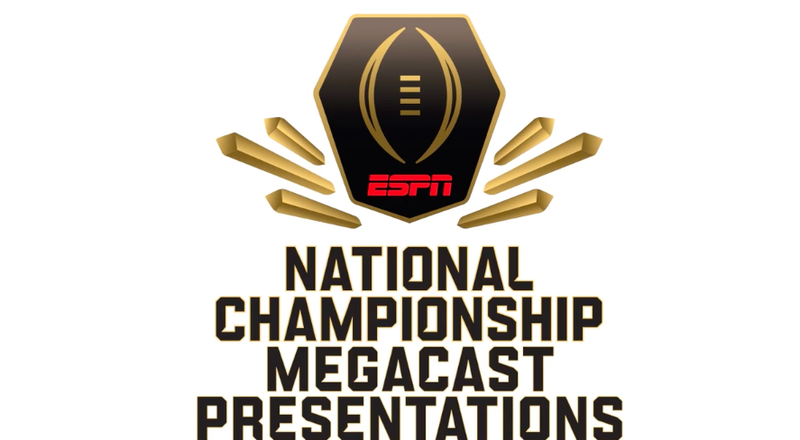 ESPN’s fifth College Football Playoff National Championship megacast will include five new presentation, complementing the existing slate of viewing options. ESPN2: Field Pass Features Adam Amin and Steve Levy Hosting Free – Field Pass will offer free-flowing commentary, anchored by Adam Amin and Steve Levy who will roam the sidelines of Levi’s Stadium. 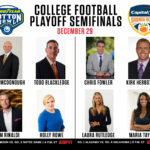 The two play-by-play announcers will call the action from the unique vantage point while simultaneously being joined by a rotation of ESPN analysts, notable personalities and celebrities throughout the game. 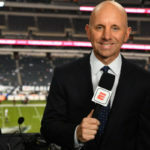 ESPNEWS: Monday Night Film Room with Joe Tessitore, Jason Witten, Booger McFarland and Todd McShay – The four football minds will breakdown the game in real time the way active players and coaches do leading up to and following each game. The production will take place within the compound of Levi’s Stadium and be presented with limited commercial breaks. 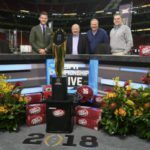 SEC Network: Thinking Out Loud with Greg McElroy, Marcus Spears and Alyssa Lang – Thinking Out Loud makes its CFP National Championship debut following a successful CFP Semifinal appearance. The trio of Marcus Spears, Greg McElroy and Alyssa Lang bring hijinks, highlights and hilarity, while offering astute analysis and reaction throughout the game. ESPN3: Goodyear BlimpCast Soars above Levi’s Stadium – BlimpCast will bring the MegaCast to unprecedented heights, as SportsCenter’s Matt Barrie and Elle Duncan will be inside the Goodyear Blimp for the full duration of the game. The unique viewing option will be tri-box, showing the duo in one screen, the game telecast in another, and the view from the blimp in the third. ESPN3: TechCast Showcases the Best of ESPN’s Innovation at all Times – TechCast will spotlight the best of ESPN’s innovation throughout the game, as 12 different camera views will be showcased in smaller boxes, surrounding a split screen view. The split screen views will rotate between the 12 options throughout the game. Among the vantage points include: SkyCam, High SkyCam, RefCam, PylonCam, AllCam, Marker Cam, and many more. These new presentations will join 12 returning offerings including Command Center, Sounds of the Game, DataCenter, SkyCam, and Hometown Radio. Overall, ESPN will offer 17 different presentations across ESPN, ESPN2, ESPNU, ESPNEWS, ESPN Classic, SEC Network, ESPN Deportes, ESPN Goal Line, ESPN3, ESPN Radio and ESPN Deportes Radio. All presentations will be available on the ESPN app. ESPN will also have approximately 250 cameras inside Levi’s Stadium. Cameras will be positioned in unique areas including inside the referees hat, the line-to-gain marker and a moveable pylon. 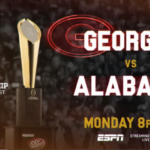 The College Football Playoff National Championship will be played on Monday, January 7 at 8 PM ET.